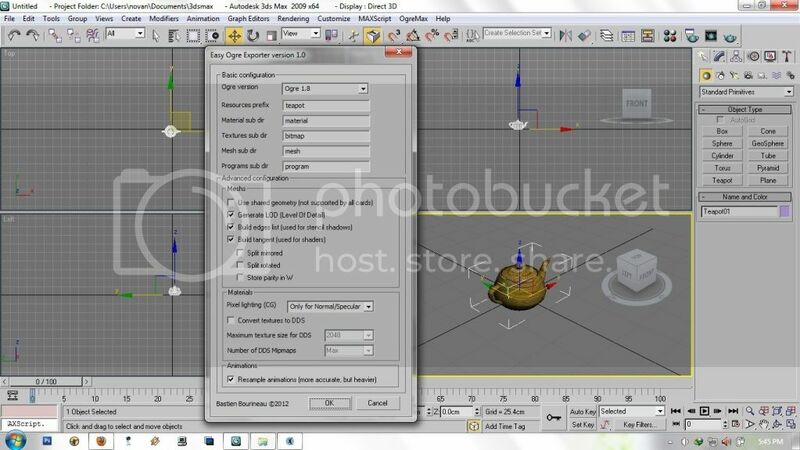 hi.. i'm having a problem when using easy ogre exporter for 3dsmax.. i made a simple 3d model using 3dsmax 2009.. the color of the object is blue.. i want to use this object in openspace 3d, so i have to convert it to ogre format.. the export process done successfully.. but when i add the object to openspace 3d scene, the color of the object change.. do you have any idea to solve this? thanks for replying me! Hello, the object color shown in max viewport is not the material color. to apply a material use the max standard materials and apply yours on the object. it export successfully, but when i import the teapot to os3d it turns to gray, can u help me please? be sure to use the "default" material not the "mental ray default" or something else. This material is correctly exported ? i use the standart material, now with 3dsmax 2009 32bit version, everything still the same, turn to gray when imported to os3d. i've send u the max file include my exported *.scene file.. In your max file you use the "architectural" material not the "standard" one, is you use max design this is possible that this material type is set by default in max. however the diffuse color is set on the ambient color for this material, i'll correct that case in the exporter. but if you want to get full textures / normal maps you will have to use the "standard" material not the "Architectural"